Happy Mother's Day, everyone! I'm so happy to be spending this special holiday with my mother, and in her honor I'm posting a giveaway today for one of my mom's absolute favorite things in the entire world -- a photo book. My mom thinks photos are more precious than gold, and whenever we have a family get-together, she's always the one with the camera in hand. She hasn't quite got the hang of digital photos yet, and still prefers hers printed out so she can leaf through all her precious memories. I'm digital all the way, but there's something to be said for printed photos, which is why I love photo books. Win a Vistaprint Photo Book! Vistaprint, a high quality printing company that offers such great products as Birthday Invitations, Custom T-shirts, and Personalized Mugs, is giving one lucky Bonggamom Finds reader the chance to build their own photo book. 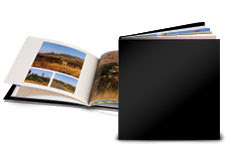 That's right, we're giving away one 12 X 12 Photo Book that the winner can personalize. You can choose from hard cover, leather cover or linen cover. It includes 26 pages and a variety of layout and design options. It's valued at over $50! I've loved Vistaprint ever since I used them to print out my first-ever batch of online business cards, so I'm happy to be partnering with them and TeamMom to offer this giveaway. Leave a comment on this post and tell me what kinds of photos you would put into your Vistaprint photobook, or which event you would commemorate on your Vistaprint photobook. 4) Grab my blog button and post it up on your blog (leave a comment with your blog URL). 5) Subscribe to Bonggamom Finds updates by email (leave a comment with your email address). 6) Become a fan of Bonggamom Finds on Facebook (leave a comment with your FB id). 7) Follow Bonggamom Finds on Networked Blogs (leave a comment with your FB id). 8) Follow Bonggamom Finds on Blogger(leave a comment with your Blogger profile name). 9) Leave a comment on any of my blog posts on Finding Bonggamom (leave a comment here with the link to the post that you commented on). Maximum of 10 entries (1 required, 9 extra) per person. This giveaway ends at midnight PST on May 24, 2010; I will draw a winner at random on May 25 and post the winner's name after the winner confirms acceptance. For additional giveaway rules, click here. Good luck! Disclosure: I did not receive a sample or monetary compensation for this post. The giveaway prize is being provided by VistaPrint and TeamMom. Unless clearly stated, the views and opinions expressed here are my own. I would load up the book with pics of family and my fiance and I and use it as our guest book! I'd upload photos of my daughter's prom. Thanks. Last summer 18 family members flew from all over the us to meet for one week to celebrate my in-laws 60th wedding anniversary. I would make a book for them. I'd either have an anime convention or San Antonio themed photo book. They're the group of photos I'm working on editing right now. I need to make a book for my daughter. She's been asking to see her baby book. I've never made her one and she is 6. Would be great to get her 1st year done in a book. It would be a biography of my future husband and I becoming one family and how two lives become one. It's really an art project in the making. I'd put pictures of my beloved pets and my dh of course! I would fill it with photos from our family vacation to the Grand Canyon. I would put in vacation photos. We ride a Harley so I'd create a book of our rides around the state. I would upload pictures from my daughters birthday. I would do our Disneyland Trip.Thanks for the chance. I would put pictures of my family and grandchildren. I'd fill it with pictures of my furbabies, past and current. Thanks for the opportunity! I have been wanting to create a photobook chronicling my daughter's first year of life, this would be perfect! I will load it with pictures of my son's Family Day and Graduation from Basic Training this coming week! Can't wait to see him after all these months!!! There will be lots of pictures!!! I've been wanting to make an album of my little girl through the years. A storybook of sorts. That's what I'd do it I won. I would use pics of my kids and trips we have taken. We are going on a much needed family vacation in 2 weeks..I would put pics of it in this book and put it in my little girls hope chest for her! I wrote on vista prints facebook wall! My name starts with Tammy and has to K's in it! I would do a book with pictures of my two sons to give to my parents. my son just had his 6th birthday party so I would do a book of that! I want to put together a book of Christmas pictures. I'd put in photos of my next family vacation. I’m your Facebook Fan Jennifer G.
i wrote on vista print's facebook wall, my name: sarah u. Fan of Bonggamom Finds on FB, my name: Sarah U.
Followng Bonggamom Finds on Networked Blogs, my name: Sarah U. A year in my kids lives is always special to me. I have taken so many great pictures of our new baby girl and I would love to make a photo book commemorating her first months of life. I posted on Vistaprints Facebook wall user Lisa G.
I left a comment on your Facebook wall with my photo user Lisa G.
I'm your fan on Facebook user Lisa G.
I'm following your blog on GFC user WWillows6. I would put in my mom with her grandchildren and present it to her for her birthday. I'd make an album from our most recent vacation. I would put vacation photos into the Vistaprint photobook. I subscribed with the email address lilyk@mail2world.com. I have seven (7) children and love looking back through their photos. I would create a photobook with all their photos and memories for a keepsake. Thanks to everyone for entering! The winner is #88, WWillows6 -- congratulations!